Recently I was introduced to a new concept: The Secret Scent Box. 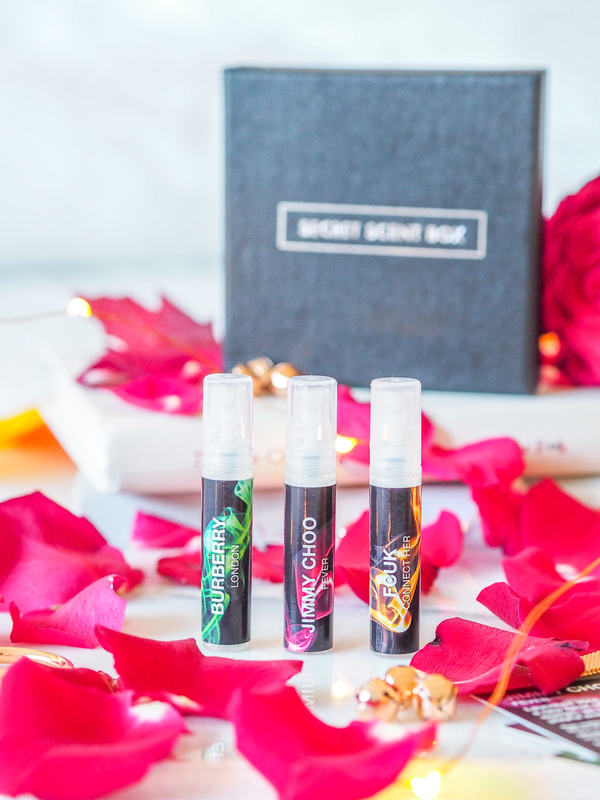 The Secret Scent box is another monthly subscription box (I know, they’re everywhere!) whereby you get a monthly supply of 3 different perfumes or aftershaves each month. Each box costs £13. In each box, there are three hand-picked mystery perfumes, which are always 100% authentic designer fragrances. 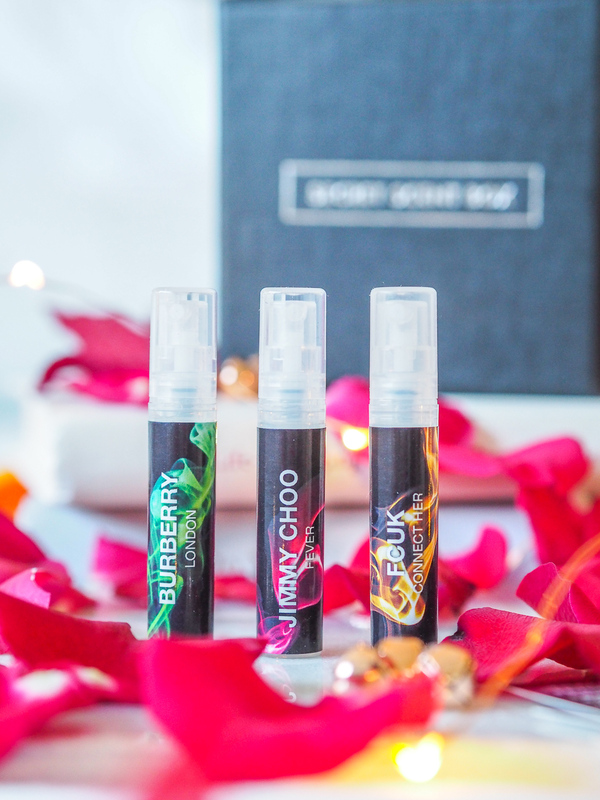 Each perfume is 3ml in size, between all 3 you’re meant to have enough to last you all month. We all know how much I love a good perfume or two, so I was really intrigued by this box. So, what did I get in my box? I was really surprised by the perfumes I received, not expecting such high-end and big named fragrances. The 3 I got were Jimmy Choo Fever, Burberry’s London and FCUK Connect Her. I love the business cards you receive alongside the fragrances. These give a short introduction on the perfumes and name the top notes, middle notes and base notes – something I’m awful at figuring out myself. It makes it a lot easier to distinguish what kind of scents you like and what notes you prefer in a perfume. Jimmy Choo’s Fever perfume was launched this year, celebrating the new facet of the Jimmy Choo woman. It has top notes of black plum nectar, lychee and grapefruit, middle notes of heliotrope, vanilla orchid and jasmine, and base notes of tonka bean, benzoin and sandalwood. This is my preferred scent of all 3, being a lot lighter, fruitier and playful. Burberry London is considered indispensable while visiting the city of London if one wants to feel the pulse of the old city. The top notes in this are rose, honeysuckle and tangerine. The middle notes are tiare flower, jasmine and peony, and it has base notes of wood and musk. This isn’t my usual style of scent but surprisingly I love it. Finally, FCUK Connect Her is a floral perfume perfect for everyday wear. Top notes include lotus, bergamot and lily-of-the-valley, middle notes of jasmine, violet, peony and base notes of musk, sandalwood, Virginia cedar and amber. This is probably my least favourite of the lot, smelling quite sharp. Overall, I really love this concept. I find it so hard to pick new perfumes and often end up going back to old favourites. This allows you to discover and try new scents, but with the opportunity to actually spend a week testing it on your skin as opposed to nipping in the shop and deciding if you like it based on a quick spray on some test paper. You’re not always going to love everything you receive but the idea of finding at least one new brilliant perfume a month is enough to have me hooked. Have you ever tried the Secret Scent Box? Do you like the concept? 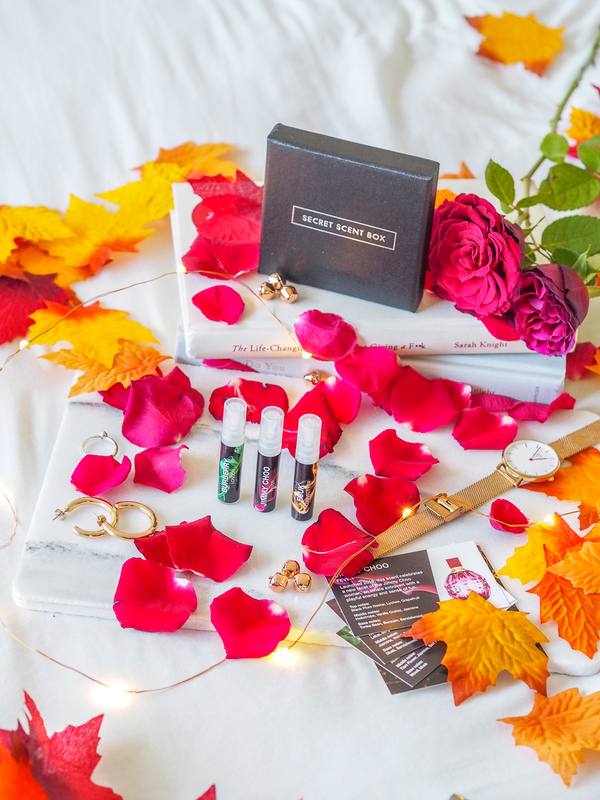 "What’s in the November Glossybox?"